Writers Quote Wednesday – My HP Homage of Writing My Novel. Just keep writing was the starter inspiration for this week. It’s been a tough, really tough week for me. The writing hasn’t been as smooth or consistent due to the day job and other issues. However I love to write, it’s a departure and freedom like none other. Therefore, here is my quote and a little Harry Potter homage of my writing my novel – Enjoy! the rubber meets the road. It gets tough, there are out side doubters – your inner critic; you’ve got to push through. This is a time commitment. You’ve got to stand your ground. You’ve got to focus on why your doing this. Get back to the story, that original idea, develop it further and carry it through. It’s going to evolve and you will too in the process. It’s a messy journey but keep going. I’m in the messy part myself right now and the finish line is within reach. But, that’s for another day to dread. At least I’ll have that 1st draft! 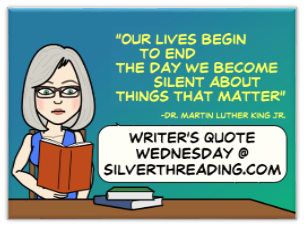 The Writer’s Quote Wednesday is organised by Colleen from Silver Threading, it is a weekly series in which bloggers share the quotes that inspire them. Go check it out and join in the fun. Made my day. You can’t go wrong being inspired by J.K. Rowlings and Harry Potter. Thanks. It’s hard when life gets in the way of your writing, but the more you struggle to get through it the sweeter it’ll be when you reach the finish line. 😉 Great post! Previous Previous post: My Passion Project, The Contest Is Completed!